For the second time in three years, Torrance-based King’s Hawaiian has settled a lawsuit against Aldi over packaging sold at the discount grocery chain that King’s Hawaiian alleged infringed its intellectual property rights. Packaging for Aldi and King’s Hawaiian stuffing mix. The settlement brings another swift conclusion to the latest lawsuit filed by the long-time manufacturer of Hawaiian sweet bread products to protect its iconic orange packaging trade dress. In this most recent lawsuit, King’s Hawaiian filed suit against Aldi — which has stores throughout the Southland — in a federal court in Los Angeles in November 2018, alleging infringement of its intellectual property rights in the distinctive packaging trade dress that King’s Hawaiian uses for its famous Hawaiian sweet dinner rolls. The suit also alleged breach of the parties’ earlier settlement agreement that had resolved a similar lawsuit King’s Hawaiian filed against Aldi in Georgia in October 2015. 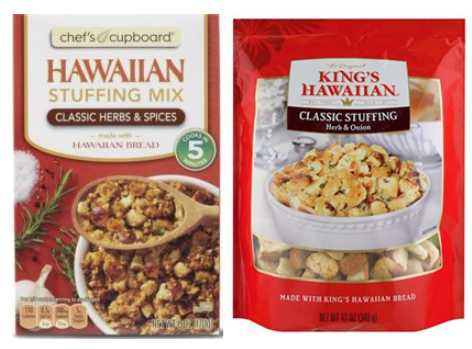 In the latest lawsuit, King’s Hawaiian alleged Aldi was selling sweet Hawaiian bread stuffing mix in packaging confusingly similar to the King’s Hawaiian packaging trade dress. King’s Hawaiian announced that it has now settled this lawsuit on confidential terms, and that Aldi will be changing the packaging for its Hawaiian bread stuffing. While the terms of the settlement agreement are confidential, King’s Hawaiian President and Chief Strategy Officer John Linehan said his company is pleased with the settlement and with the resolution of the lawsuit. King’s Hawaiian has filed and favorably resolved several similar lawsuits over its distinctive packaging trade dress in recent years in federal district courts across the U.S., including in California, Georgia, and Illinois. These include lawsuits against Sprouts Farmer’s Market, Alpha Baking Company, and Pan-O-Gold Baking Company. King’s Hawaiian resolved its lawsuit against Sprouts in 2015, Alpha Baking Company in 2016, and Pan-O-Gold in 2018. In addition, according to King’s Hawaiian, the company and its legal team have also resolved other instances of alleged infringement on terms favorable to King’s Hawaiian without the need to file a lawsuit in federal court.